Taxila (Staff Report): Interior minister Chaudhry Nisar on Friday said that he agreed with former president Asif Ali Zardari’s stance that why sweets were distributed as Panama case is still in courts. While addressing a press conference, Nisar said that there was no difference of opinion between the judges giving the Panamagate verdict, adding that all the judges of the bench in the Panamagate case agreed to form a Joint Investigation Team (JIT). 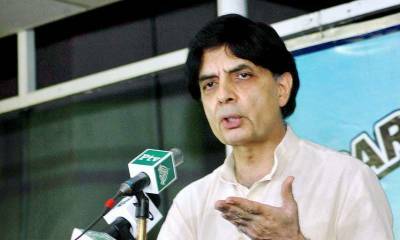 “Let’s leave it up to the apex court to decide on the issue as the JIT report will be submitted to it after it’s probe,” Nisar said.